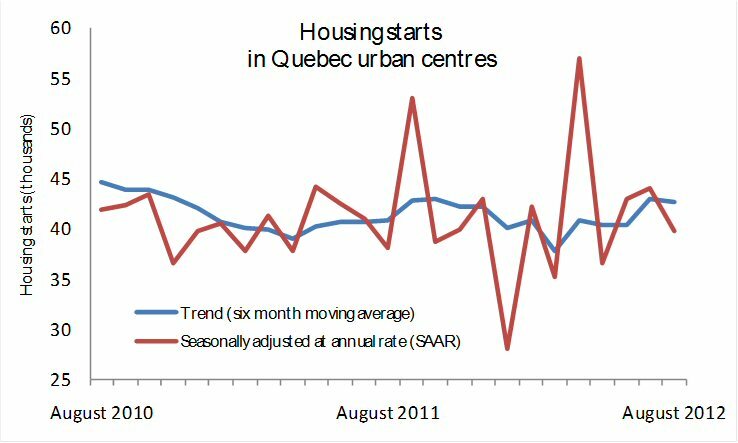 MONTREAL, QUEBEC--(Marketwire - Sept. 11, 2012) - In Quebec urban centres, the number of housing starts was trending at 42,600 units in August, according to Canada Mortgage and Housing Corporation (CMHC). The trend is a moving average of the monthly seasonally adjusted annual rates (SAAR)(1) of housing starts. The standalone monthly SAAR was 39,700 units in August, down from 44,000 in July. For some markets, CMHC uses the trend measure as a complement to the monthly SAAR of housing starts to account for considerable swings in monthly estimates and obtain a more complete picture of the state of the housing market. Analysing only SAAR data can be misleading in some markets in some situations, as housing starts are largely driven by the multiples segment of the markets, which can be quite unpredictable from one month to the next. Elsewhere in the country, August's seasonally adjusted annual rate of urban starts increased in all other regions. In each region, the increase was mainly due to changes in multiple starts. (2) CMHC estimates the level of starts in centres with a population of less than 10,000 for each of the three months of the quarter, at the beginning of each quarter. During the last month of the quarter, CMHC conducts the survey in these centres and revises the estimate. ** Urban centres with a population of 10,000 and over.